Disney villains get a bad rap. If we look closer, many are just… good at business! One of the most misrepresented is Ursula from The Little Mermaid. Disney villains get a bad rap. If we look closer, many are just… good at business! One of the most misrepresented is Ursula from The Little Mermaid. The deal she’s offering isn’t great. But she’s upfront about the terms and there’s the option to say “no”. Is she really a villain? 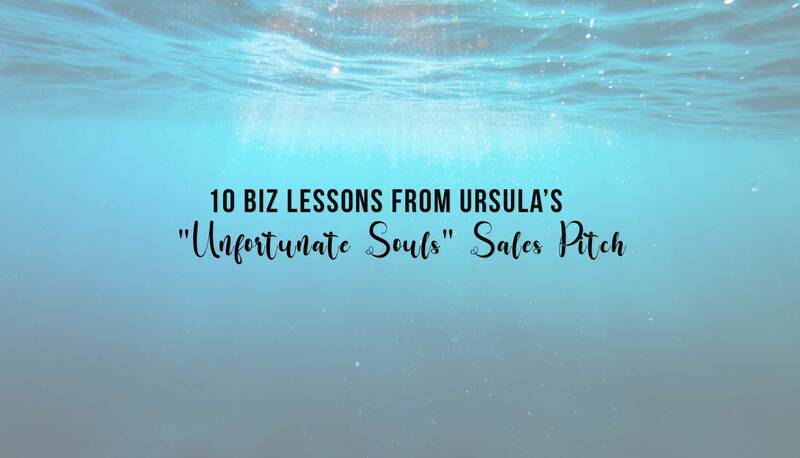 Whatever side you’re on, there’s a lot to be learned from Ursula’s infamous “Unfortunate Souls” sales pitch. Admitting mistakes shows transparency and a willingness to progress in the right direction, for everyone’s benefit. If you’re good at something, have the experience or training to meet a need, have a passion that drives you to bring your best, put that on display! Make people aware of what you have to offer and what makes you unique. Why do people come to you? What problem do you solve? People seek out products or services when they have a need, want or problem. Make it clear what you address and that people are already coming to you for it. Ariel: “But I don’t have-” . Ursula is asking a lot. But the key is that she’s upfront about it. There are no surprises. There’s nothing like hidden fees to incite negative press. Some people may turn away when faced with payment, but that’s far less damaging than people publicly complaining about being duped. That’s bad press you just can’t come back from. Oh, Ursula! Sassy she may be, wrong she is not. I’m not suggesting seducing clients. But be aware of body language with clients, partners or colleagues. Are you arms crossed or open? Are you fidgety or attentive? Not sure what to do with your hands? Put them in your pockets. It keeps your body language open and stops the fidgeting. “Come on you poor unfortunate soul. Go ahead. I’m a very busy woman and I haven’t got all day. You’ve got the pay the toll. Insist on a signed contract or agreement before any work begins. This protects you both and ensures all parties are aware of, and agreed to the terms. This is more a lesson from Ariel than from Ursula. Never sign a contract without first consulting a legal professional. It’s simply good business. You had a lawyer review your contract. But, are they an expert in your field or industry? Consider consulting an expert on the subject of your agreement before signing anything. Remember, no surprises! Just as important as clarity on pricing is clarity on the end result you’re promising. Showing the end result is a powerful sales tactic, but also protects you in the event someone demands a result that was never promised. Pictures, videos and diagrams can create huge impact! Show the problem you address, how you help, what the process looks like, expected end results… visuals are incredibly impactful. Use them.